Victoria, Mahe (Seychelles) – February 12, 2019 (travelindex.com) – This week, we’ll see the ceremonial handing over ceremony of the Vanilla Islands Flag to Seychelles, as it takes over the Presidency of the Vanilla Islands once again. Delegates arriving in the country are:- Reunion – The Vice President of the Regional Council Faouzia Vitry, IRT – Vice- President of the Regional Council Olivier RIVIERE, IRT – CEO Stephan ULLIAC, Mayotte – President of the Department Ibrahim RAMADANI SOIBAHADINE, Director of the Cabinet Ahamada OUSSENI, Vice President of the Tourism Office Mohamed BACAR, Advisor for International Relations Ahmed Attoumani DOUCHINA, Director of Regional Cooperation & European Matters Michele BALOURD, Comoros – President of the Tourist Office Souef EL HAYIRAT, Director of the Tourist Office Rachid MOHAMED, Mauritius – Minister of Tourism Anil GAYAN, Deputy Permanent Secretary Rechad MOOLYE, MTPA – M. BOODHUN, Seychelles – Minister of Tourism Didier DOGLEY, PS for Tourism Anne LAFORTUNE and CEO of the Tourism Board Sherin FRANCIS are expected to bee present alongside the CEO of the Vanilla Islands Pascal VIROLEAU. (Madagascar is not present for this meeting in Seychelles because the newly elected President is personally chairing a tourism meeting to set the way forward for tourism on the Big Island). As the current Tourism Minister of Seychelles, it is Minister Didier DOGLEY who will take over the Presidency. Tourism’s private sector trade present at the last Cross Sectorial Meeting in Victoria were presented with interesting figures on “Value Added of Tourism Related Industry at Current Market Prices – in Seychelles Rupees Millions)”. The years of success depicted by the slide, cover the years when I was responsible for Seychelles Tourism and showcases my legacy in a visual format. As much as I can be proud of these successful years, I remain grateful for the Team who were by my side and this includes the close working cooperation with the Private Sector Trade, the industry’s front line team. But, as we look at those historical figures, we need to appreciate that Seychelles cannot take its tourism industry for granted. We need to remain on the ball, innovate and be seen to be the leader. These tourism arrival figures speak volumes and should make us in Seychelles, as well as main land Africa, reflect on tourism and plan tourism as being an industry and not just as an activity. Travel Warnings continue to hurt Africa, as was the case of a cruise ship heading to Mombasa that was diverted to Seychelles, just as the Port Authorities of the island deciding to now give docking facilities to cruise ships to just a day before moving out to anchor and to use ship’s tender boats for passengers to get ashore. Seychelles spent time and money to encourage cruise ships to stay longer in Port Victoria and in so doing encourage the 55+% of passengers who remain on board and do not buy shore excursions, to walk out and take a taxi and buy some local ‘Made in Seychelles’ handicraft. This decision is dealing with the symptoms and not acting on the cause of the problem. Will that decision impact cruise tourism to Seychelles, will the taxi, restaurants and handicrafts, excursion guides and private parks and gardens businesses suffer as a result? Only time will tell. MS Nautica, of Oceania Cruises, has reportedly changed course to the Seychelles, after US authorities have issued a stark travel warning to their citizens about the possibility of further terror attacks in Kenya, targeting tourists. While there is consensus among leading tourism figures in Kenya that the US anti travel warning could once again be to establish legal cover – as often seen in the past when such anti travel warnings were in the end unceremoniously withdrawn – has the impact of the warning promptly cost Kenya a major business opportunity. Kenya, despite recent events, is generally considered safe for visiting tourists and anti travel advisories from the US – Kenya’s largest foreign market segment – the UK and other nations have in the past adversely affected the entire industry and in particular the Kenya coast. Cruise ship visits to the port of Mombasa bring in multi million Shillings in a day through excursions, air safaris and also ship handling and ship supply services and the cancellation of the port call will leave the tourism handling agents for the ship counting their losses as they had prepared tours for guests who will now go on shore in the Seychelles. More than 400 tourists and a similar number of crew were on board the MS Nautica. Still in Seychelles, this time it is the Chairman of the Praslin Business Association who wrote in to update us on their last General Meeting. Praslin Island, the home of the Unique Coco de Mer Nut has been the centre for tourism for many years, but this is changing fast and the island’s community are moving to take the situation on hand and to work with the Government to mitigate the challenges. The Association’s Chairman said he used the meeting to point out that the year 2019 will not be an easy one for the business community and that the Association will do its utmost to try and address the pertaining issues with respective ministries and other stakeholders. The Election of the Office Bearers of the Praslin Business Association saw William Rose move in as the Patron, Christopher Gill as Chairman, Paul Rouillon as Vice-Chairman, Adrian Uzice as Secretary, Leroy Lesperance as Treasurer and Nigel Payet as Honorary Member/Consultant. The Islands Development Company, IDC, says it will build new hotels and villas on Seychelles’ outer islands as part of its expanded tourism offerings. Tourists will soon have the ability to essentially occupy an entire tropical island, one that will have only one villa on it. IDC sees increased returns. For the period 2017-2018, the company’s total revenue was $33.6 million (SCR458 million) and “80 percent of that amount was from the tourism sector. So there is great potential there,” Patrick Berlouis, the chair of IDC’s board, told SNA. The Islands Development Company, which is responsible for the sustainable development of the outer islands, manages 14 islands. It has a permanent presence on 12 of them and projects are now on the way to establish various facilities on the last two — Cosmoledo and Providence. Berlouis said that between now and 2023, major tourism activities will be undertaken on these islands. These will include eco-tourism hotels, eco-lodges, private-owned villas, as well as an exclusive villa to be marketed under the ‘rent an island concept’. The first project, expected to start later this year, is the construction of a 55-room eco-tourism hotel on Platte, a coralline island which lies 140 kilometres south of the main island of Mahe. An environment impact assessment is presently being carried out on Platte island. “This project is a good investment because although there is a limited number of rooms, the clients will be paying a substantial amount of money to stay at the hotel. We are talking of a 4 to 5-star establishment. So everything is geared to having a premium product aimed at the high end of the market who can afford these exclusive experience on an outer island,” said Berlouis. The chairperson said this will be the biggest hotel project so far on outer islands managed by IDC. Four Seasons Desroches Island, which opened its doors in March 2018, is the largest to date with 40 rooms. IDC has also conceptualised eco-lodges for southern islands, like Astove, Farquhar, Cosmoledo and Providence. Berlouis said it is because these islands are more fragile that IDC will limit the scale of tourism developments there. The management of the six- to eight-room ecolodges on Cosmoledo and Providence will be tendered out. An ecolodge is a tourism accommodation designed to have the minimum possible impact on the natural environment in which it is situated. “We want to attract fly fishing enthusiasts, who are willing to pay a top price to have this experience. So the impact on the environment will be minimal but returns to the company will be high,” he said. Coetivy — renowned for its black tiger prawn farm in the nineties and early 2000 — has also been earmarked for two major tourism projects once the government transfers the lease of the island to IDC. 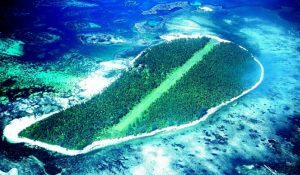 A boutique hotel of 30 to 40 rooms is planned for Coetivy located 290 kilometres from Mahe and a 4-star hotel with approximately 100-120 rooms. IDC is also looking at making available between 85 to 100 privately-owned luxury villas on the island. Remire, an island of the Amirantes group, will be marketed as a ‘rent an island concept’. “Most people would enjoy having an island to themselves and this is what we have in mind with this project. To have an exclusive villa on the island where a group of people can come and spend their holidays in privacy,” said Berlouis. IDC also plans to have conservation programmes alongside tourism development. The Marie Louise island which became a bird sanctuary last year has the potential for a small ecotourism project of 4 to 5 bungalows especially for bird watchers or for scientific research. Another ecotourism project will be on Assumption, the largest outer island of Seychelles after Aldabra. IDC plans to build guesthouse facilities to be used by visitors overnighting on the island on their way to and from Aldabra. Berlouis said all construction work will be carried out by IDC. “We follow strict guidelines when building on outer islands as we have to take into account the ecological aspects of the islands,” he added. This is the third islands development plan of IDC which also outlines other projects such as agriculture, aquaculture, conservation and rehabilitation of islands. The company will also be building more facilities to cater to locals who want to visit those islands. The Islands Development Company is a parastatal company created by government in 1980 and is registered under the Companies Act of 1972. The company is wholly owned by the Seychelles government through Société Seychelloise d’Invéstissement — a government-owned investment holding company. Copyright © 2019 Thailand Connect. All rights reserved. Powered by Travelindex.